The 8 hearts and arrows cut are brilliant cut stones, but are cut to perfection, so they look even sharper and clearer. Most diamonds are not cut with hearts and arrows, only the most expensive ones are cut this way, it is the best round cut for diamonds and significantly adds to their price. These hearts and arrows cut stones can really make a difference to your jewellery. It is hard to show with photographs or video, so please buy one to compare. 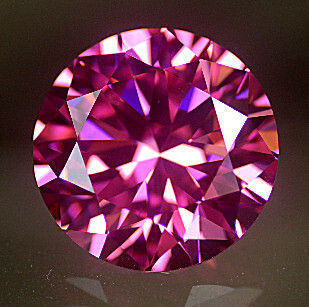 Often the pink material will be consistant, but can sometimes be produced with a peachy tint.